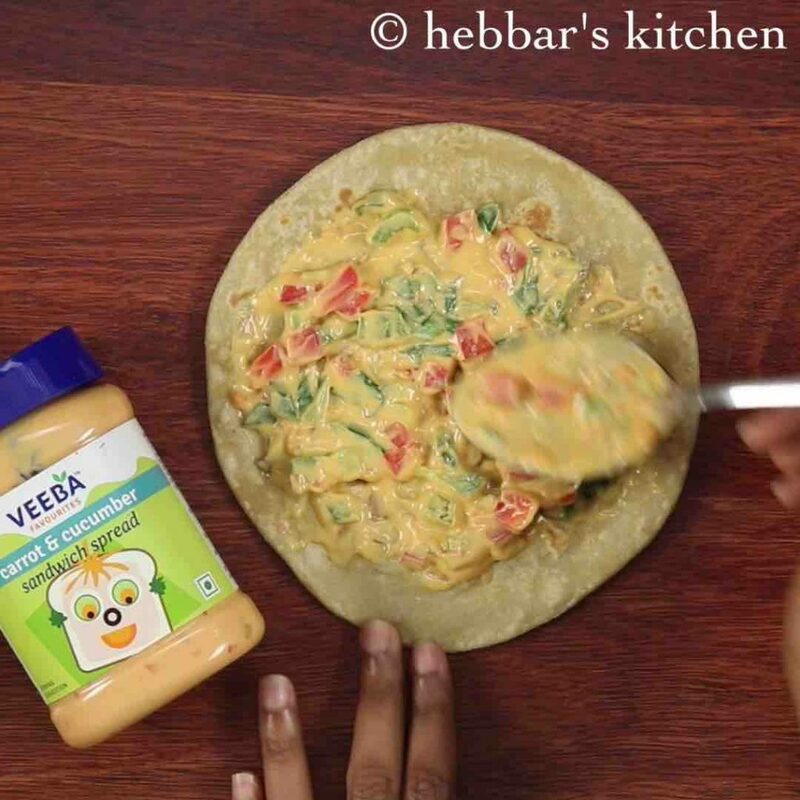 chapati roll recipe | chapati pinwheel sandwich | left over chapati recipes with detailed photo and video recipe. 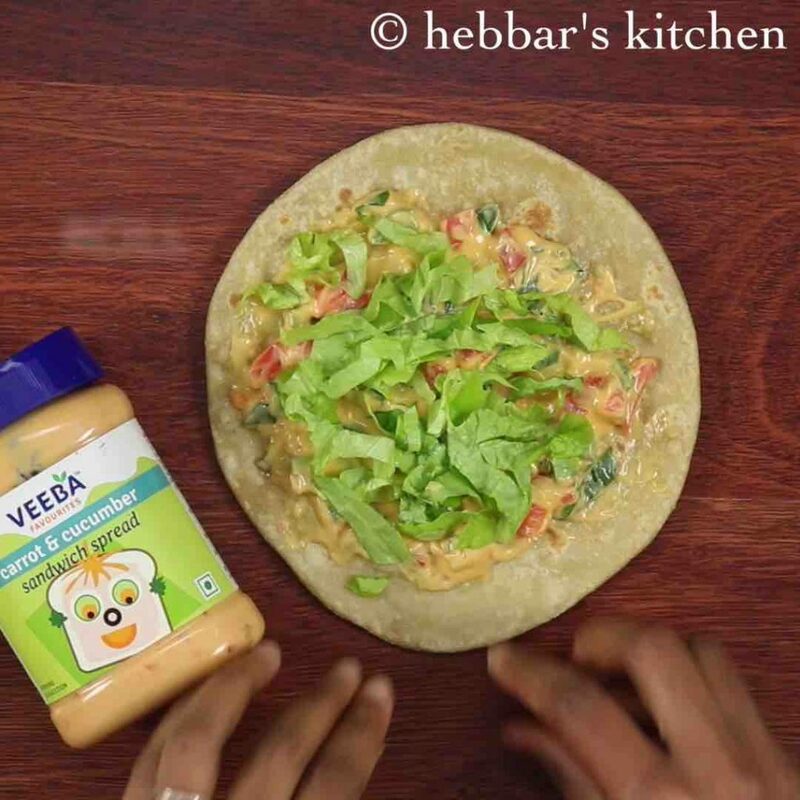 an easy and healthy sandwich or roll recipe which is ideal for kids snack or lunch box. 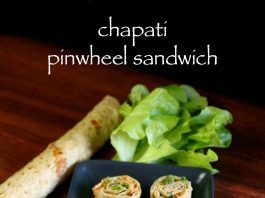 the chapati pinwheel sandwich can be easily prepared with any leftover chapthi’s / roti’s and certainly would be loved by kids and adults. 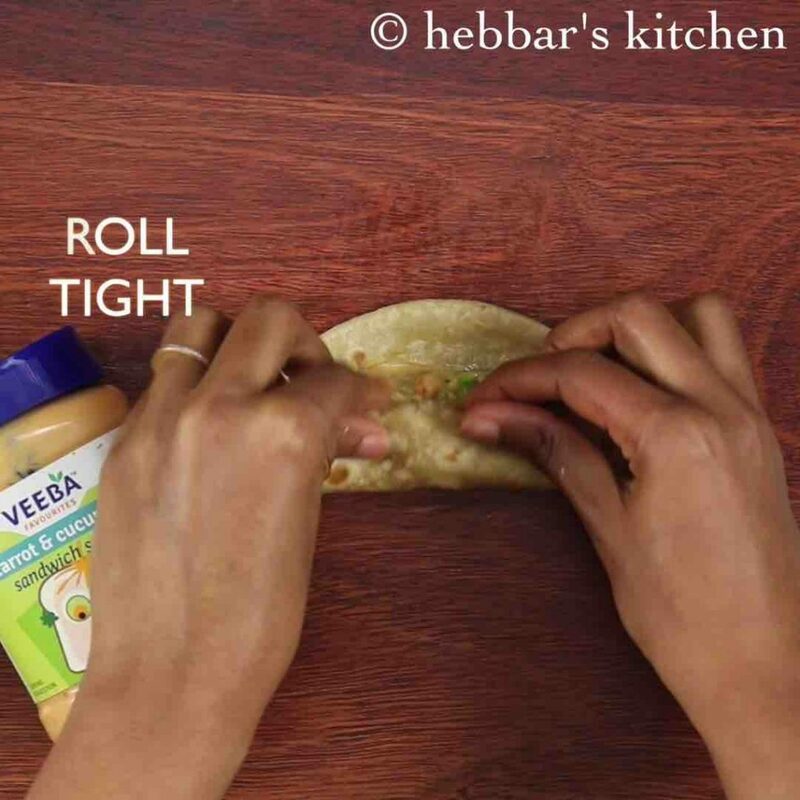 chapati roll recipe | chapati pinwheel sandwich | left over chapati recipes with step by step photo and video. the chapati rolls can be prepared with any leftover curries too. 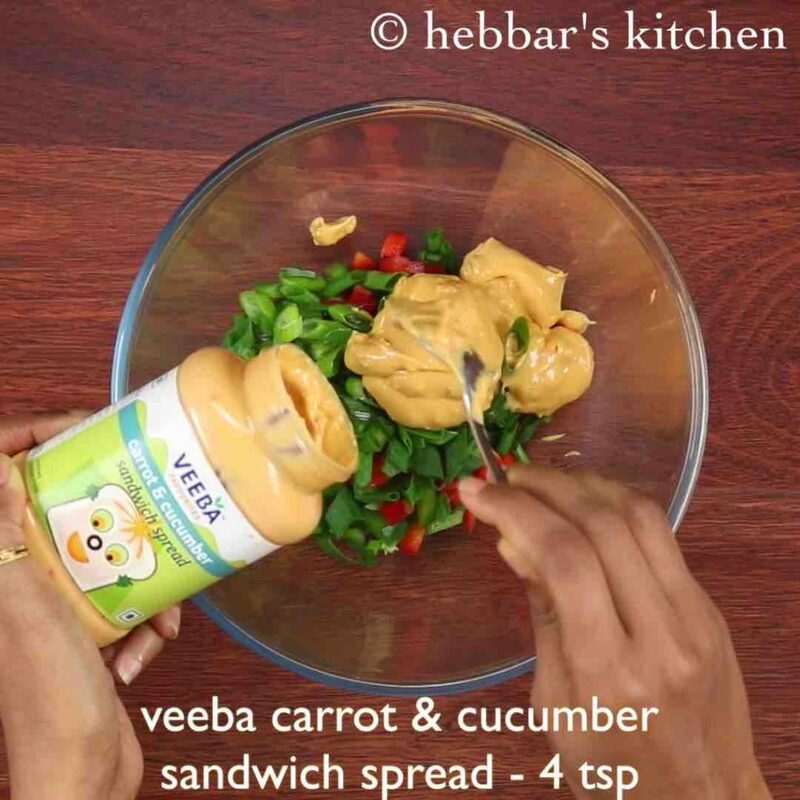 but in this recipe, carrot and cucumber sandwich spread is used which is mixed with finely chopped capsicum and spring onions. later it is spread to left over chapati and rolled and sliced to pinwheel sandwich. i prepare chapati rolls recipe frequently as most of the time i end up having leftover chapati and i prepare it with any left over curry or sabzi. basically i add some finely chopped onions and tomatoes with the left over sabji and roll it with chapati. optionally i even add some green chutney and tomato sauce too which makes it spicy and tangy. my husband likes this a snack especially during evening with masala chai. i personally like chapati pinwheel sandwich with carrot and cucumber sandwich spread and aloo bhaji or potato bhaji recipe. furthermore, some important tips and recommendations for perfect chapati roll recipe. firstly, i highly recommend to use soft and rollable chapati’s or roti’s otherwise it may crack while rolling. alternatively if the roti’s are hard, heat it on tawa with some oil till it soften’s. secondly, the addition of veggies is completely open ended and you can add cabbage, corn, carrot and even mushroom. further, the recipe can also be extended with cream cheese, mayo instead of carrot and cucumber spread. 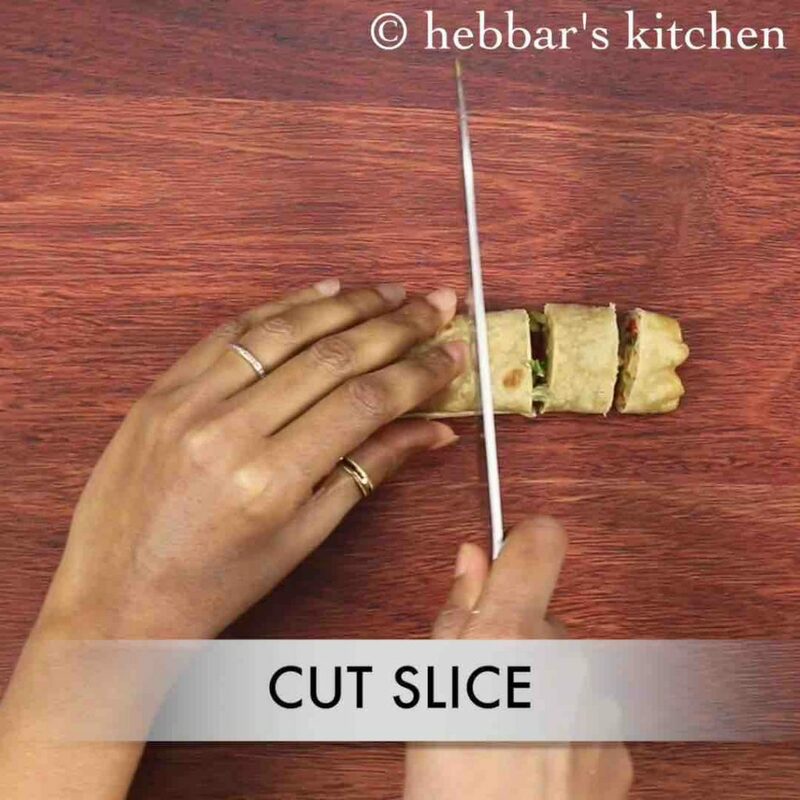 finally, refrigerate the chapati roll for minimum of 30 minutes before slicing it to pinwheel shapes. 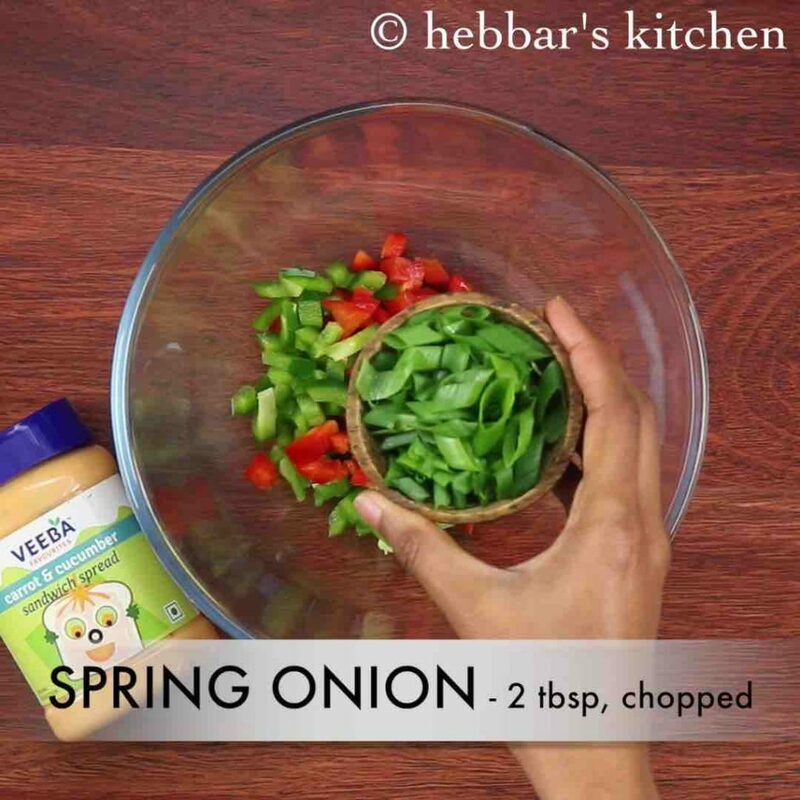 firstly, in a mixing bowl take 1 cup capsicum and 2 tbsp spring onions. add in 4 tsp carrot & cucumber sandwich spread and mix well. now take leftover chapati / tortilla / wraps and spread a tbsp of prepared sandwich spread. top with 3 tbsp of lettuce. roll tight, making sure the stuffing stays inside. repeat and prepare 2 more rolls. wrap with cling wrap and refrigerate for 30 minutes. after 30 minutes, unwrap it and cut slices. 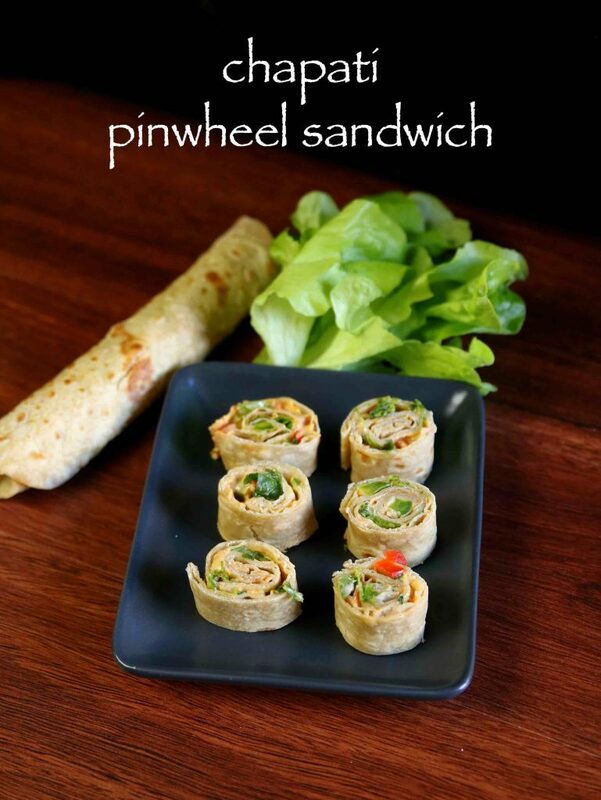 finally, serve chapati pinwheel sandwich to kids or pack for lunchbox. 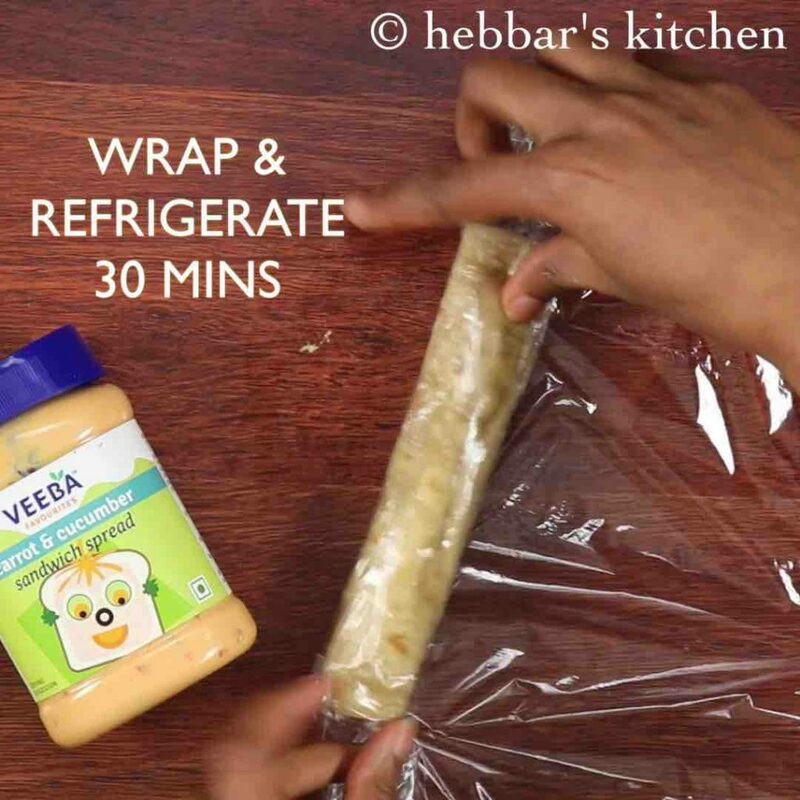 wrap with cling wrap and refrigerate for 30 minutes or overnight. firstly, use fresh or leftover chapati / tortilla / wraps. also you can add layer with grated cheese to make it more flavourful. additionally, use fresh palak or spinach leaves instead of lettuce. 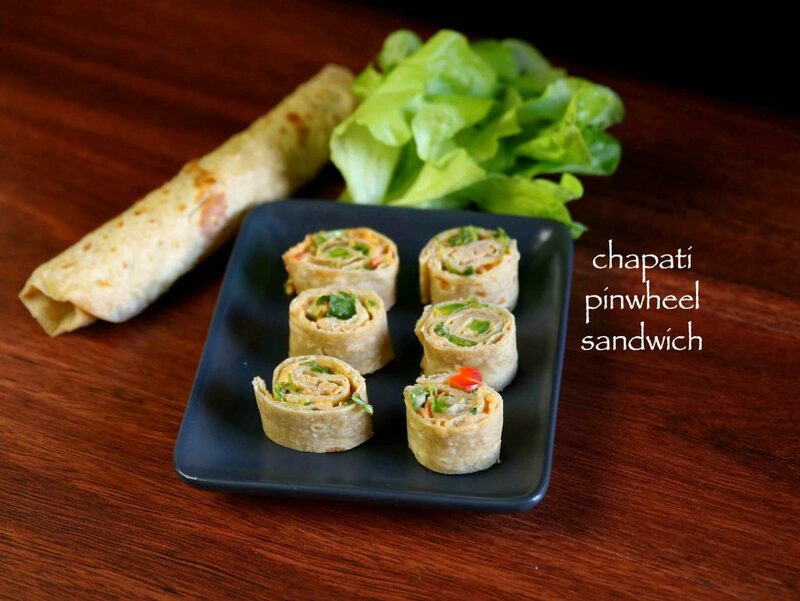 finally, chapati pinwheel sandwich taste great when packed for lunch box.